PVC (polyvinyl chloride) pipes and fittings can withstand a variety of environments for 100 years or more, according to the Plastic Pipe and Fittings Association. In most cases these strong materials outlast the structures they're used in. PVC pipes and fittings are welded with PVC cement solvent. The strength of solvent-welded pipes and fittings depends on the application process. If the joints are welded properly, there should be no plumbing or leaking issues with the connection points. A PVC pipe joint that will be welded to a PVC pipe. The primary applications for PVC include water distribution, process piping, sewer lines and drain, waste and vent lines, according to the Plastic Pipe and Fittings Association. Each application uses a standard pipe size for different installation areas, such as water transmission and water mains. Each type of pipe withstands different flow pressures and temperatures. Some local and state jurisdictions regulate the use of PVC pipes, primers and cement solvents. This includes PVC pipe sizes for different applications and what type of solvent cement can be used. Some jurisdictions require the use of colored or cement solvent that becomes visible under a black or UV light. These types of solvents can be easily viewed by building and plumbing inspectors to ensure the fittings are properly welded. Jurisdictions that apply air quality standards to protect the environment also require low-volatile organic compound products. When PVC pipes and fittings are welded correctly, the joints are very strong. To ensure a correct fit, cut PVC pipes and fittings should have a smooth edge and be cleaned after cutting with a dry cloth or paper towel. Follow the PVC manufacturer's instructions. If the manufacturer suggests a specific brand of primer and solvent cement, use that brand for the best results. Follow the application instructions carefully. Don’t allow the primer to dry before applying solvent cement. The primer and solvent cement together create a stronger bond or weld. If the PVC pipes and fittings are applied and welded correctly, they will withstand the installation environment for many years. 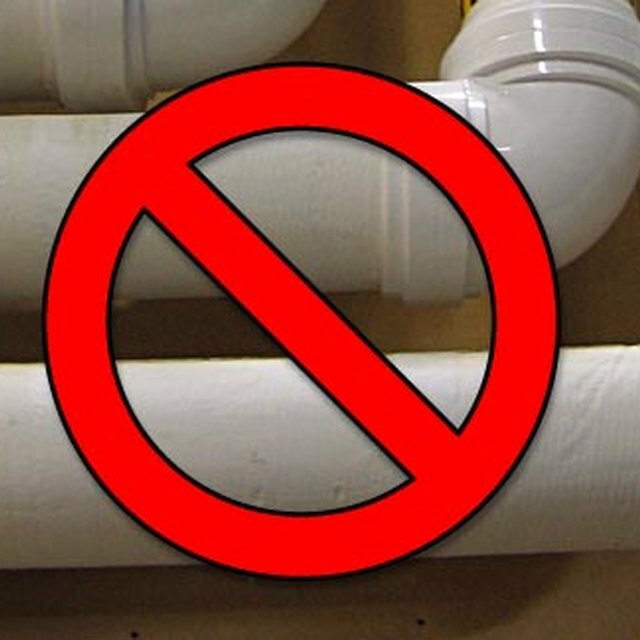 If the PVC joints leak or require repair, they should be cut out and replaced with new PVC pipes and joints, according to the Plastic Pipe and Fittings Association. PVC expansion repair couplings are used to replace joints. These couplings can be purchased at plumbing supply or home improvement stores and come in a variety of sizes to fit the PVC pipe. What Are the Dangers of PVC Racks in a Dishwasher? What Is the Mill Pressure Test for Pipe?